This project will demolish the existing Ferry Field Locker Rooms building that no longer meets the needs for the current level of prominence of the field hockey program, and construct a new field hockey team center. The new 13,000-gross-square-foot building will house locker rooms for players and coaches, offices, training facilities, hydrotherapy pools, meeting space, and broadcast capabilities. The project will also construct a new grandstand with a capacity of 1,500 spectators and an approximately 2,000-gross-square-foot concessions building with public restrooms. 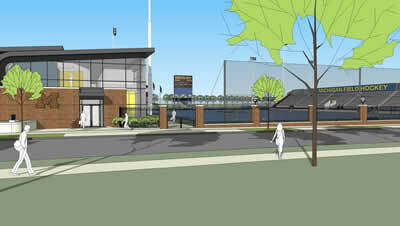 Ocker Field will be completely refurbished with new turf, a new scoreboard, and new field lighting. This project will permanently displace ten parking spaces.